The high street is the best friend of any budget bride for outfits and accessories. You can clothe yourself, your bridesmaids and your groomsmen all from the high street. BHS, Debenhams (and any local department stores), Littlewoods, M&S, Phase Eight, Monsoon etc. BHS’s wedding dress range is one of the biggest and best ranges you will find on the high street. TKMAXX now has a wedding boutique! The range includes wedding dresses, wedding shoes, BM dresses, MOB dresses and flower girl dresses. If you’re having a slightly inconvential, relaxed or wedding abroad then TKMAXX really is the place to look for budget wedding idems. The high street has more to offer for your wedding day then you first think. Beautiful wedding dresses, lovely bridesmaids dresses, shoes to die for, veils (traditional and birdcage), tiaras and hair slides etc, mens suits, waistcoats and cravats, you name it, the high street has it! 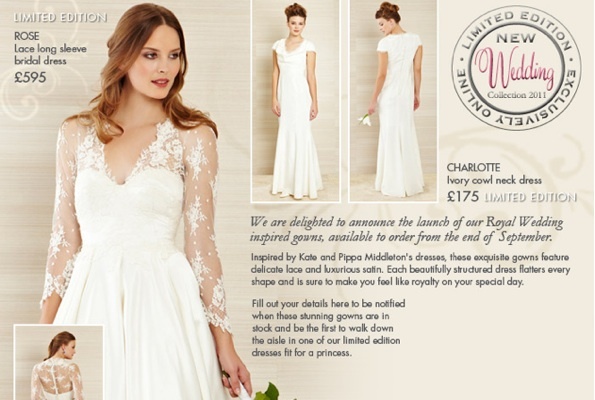 Sometimes it may not be your local shop that has it, but their website will, and the great thing is often the prices are so much cheaper than the bridal store equivalent, especially in the sale! Discount shops on the high street can also be great, think Poundland, 99p Store etc for your invites, balloons to decorate, banners, cake/favour boxes. They will be simpler than the more expensive alternative, however they can still look lovely and provide simple chic to your decorations and extras. Waitrose and M&S do scrummy wedding cakes at a fraction of the cost that a specialised wedding cake maker could. With the range of styles and colours on offer you are bound to find a cake that will suit you. The other way to get yourself a high street cake but to have it more personalised, it to but the plain round cakes that are on offer (these can be bought not only from Waitrose and M&S but Sainsbury’s, Tesco and Asda as well), if you look around you will be able to find fruit and sponge varieties, and if you hire a cake stand you can can 1,2 or 3 tiers and buy ribbons, flowers and other decorations to personalise your cake to fit into the theme of your special day.